Though he played the evil Doc Oc in “Spiderman 2,” Alfred Molina now tackles an even more invidious creature: a talent agent, in Howard Katz, a tragicomedy by Patrick Marber, opening March 1 off Broadway. A Roundabout Theater staging, the play began previews Feb. 2 and runs to May 6 at the Laura Pels Theater. Told in flashback, Howard Katz traces the midlife crisis, nervous breakdown and career freefall of a married, middle-class agent. Central to Katz’s character is his Jewishness, which he’s ignored but hasn’t quite shaken off. According to a review of the show’s 2001 UK premiere at the National Theatre’s Cottesloe, Katz “constantly appeals to and rails against God.” This would make it an interesting fit for Molina, since his last New York assignment was the God-questioning Tevye in the 2004 Fiddler on the Roof revival, where some critics complained that he didn’t come off as Jewish enough. Also appearing in the Roundabout’s Katz are Alvin Epstein, Elizabeth Franz, Jessica Hecht, and Taboo’s Euan Morton. Franz won a Tony for the last Death of a Salesman revival; Hecht’s theater resume includes Stop Kiss and playing Portia in the Denzel Washington Julius Caesar. Author Marber previously penned such caustic works as Dealer’s Choice and Closer, which reached Broadway and which Marber then adapted for a film version directed by Mike Nichols and starring Julia Roberts, Natalie Portman, Jude Law, and Clive Owen. Marber also penned the screenplay for last year’s “Notes on a Scandal,” with Judi Dench and Cate Blanchett. Howard Katz director Doug Hughes won a Tony Award for staging Doubt. 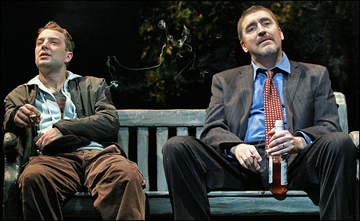 The Roundabout Theater Company’s production of Howard Katz ran March 8-May 6, 2007 at off-Broadway’s Laura Pels Theater.